Options are luring and thus one need to understand the terminology associated with it. A contract is ‘in the money’ when a profit can be made from exercising the contract. The below image explains the same very beautifully and remember to note the breakeven point and extra calculative traders should not forget to add the brokerage associated with options trading. Check the best broker in India who charges minimum brokerage and trade with minimum brokerage else it is like a black hole which keeps eating into your profit with you even realising it. 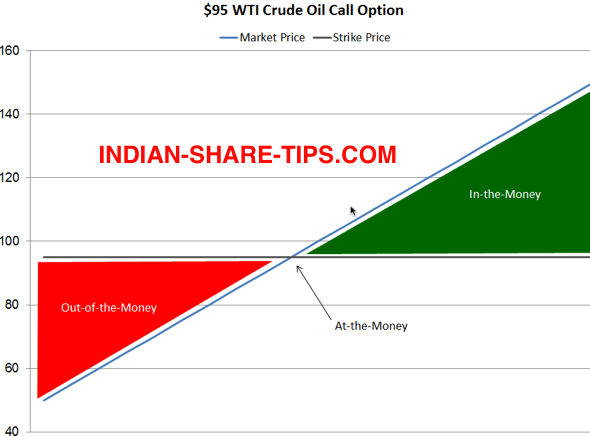 A call option is ‘in the money’ when the settlement value of the asset is higher than the strike price. A put option will be 'in the money' when the settlement value is lower than the strike price. An option contract is ‘out of the money’ when a profit cannot be generated from exercising the contract. A call option is ‘out of the money’ when the strike price is higher than the spot value of the asset. A put option is ‘out of the money’ when the strike price is lower than the spot value of the asset. Check our take on the options that why buying options is not good for your financial health unless you are going to use it as a hedging tool. Alternately use the intraday tip and make money like professionals with a small capital of Rs 10,000. Remember to read F&O Basics before you start trading in this segment.